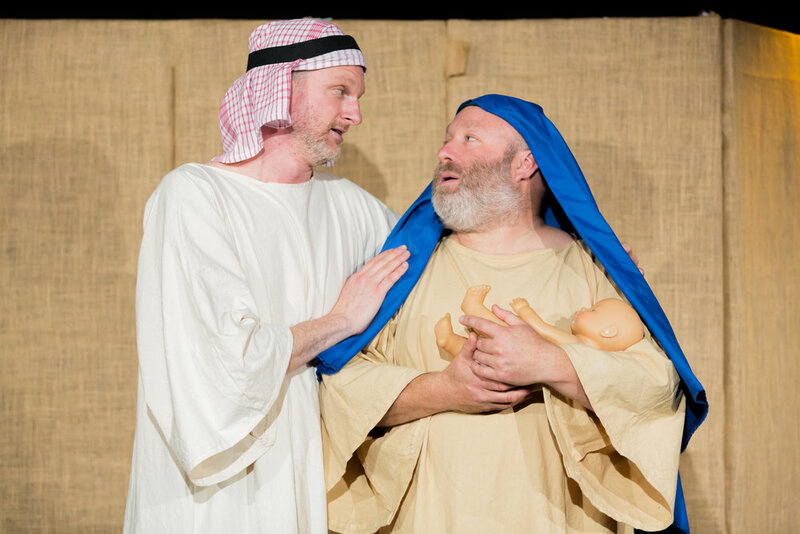 The holy journey to Bethlehem has a long history of being chewed up by generations of primary school productions. Thus, Living Spit’s mangling of the Nativity story was greatly anticipated by this reviewer. Their last visit to the Mumford was a triumphant version of the Six Wives of Henry VIII; a brilliant tour de force and a celebration of the art of character acting. The company consists only of two men, Howard Coggins (who was the spitting image of King Hal) and the gawky Stu Mcloughlin, yet between them they are capable of playing a myriad of personae male, female or fluid gender. Their comic timing is nigh on perfect and in magically rendering a cast of thousands also give us something of themselves and their own often brittle and edgy stage relationship. In their show last year, they had what appeared to be a furious row as actors over who was getting more limelight – Stu even walked out of the theatre and there was a precious moment when we all felt this was real. Not so of course. Their new show though funny has lost that edge. Coggins plays a bored God looking to cheer himself up by creating the saviour of the world. Mcloughlin as his sidekick the Angel Gabriel is fed up at not having any power – must he always be just a messenger? As the story unfolds, the odd couple play Joseph and Mary, two of three wise men (the third we are told is ‘in the car’), a dastardly pantomime King Herod complete with massive hat and a torrent of expletives. Though the lads never deviate from the basic Nativity story, massive liberties are taken with it including a father-son pair of dim shepherds. There is comical contrast between the grandeur of the holy tale and the deliberate shoestring nature of the costumes and set (a Living Spit trademark). A short hessian screen provides the barely-sufficient cover behind which the boys do their amazing quick changes and the musical accompaniment is produced by a large, badly scuffed 1970s cassette deck. The couple play instruments and have fine singing voices ending the show with a very clever take on Handel’s ‘Hallelujah’ chorus. Too silly to be offensive to churchgoers or those who cherish the baby Jesus narrative, the show nevertheless misses a few easy targets. There was none of the interplay of Coggles and Mcloughlin as actors, no inner tension though we got close to it with a very funny spat between God and his Archangel in which they appealed to the audience for support. The scene in which tens of baby dolls were doled out to the audience so that we could rip them apart in a ‘massacre of the innocents’ went on far too long and wasn’t particularly amusing. Despite these caveats, this is a very cheery show with two highly skilled actors at the top of their game. I for one will follow their progress - though maybe not to Bethlehem.